The most portable bed rail on the market! Requires no assembly. Weighs only 7lbs, folds for travel and even fits in a suit case. Features a cushioned foam grip that is easy to sanitize. The rail is 17" wide and 22" high to accommodate thicker pillow top mattresses. Attaches to any size home or hospital bed frame with included safety strap. 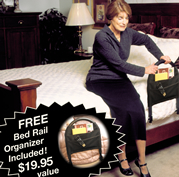 Includes 4-pocket Bed Rail organizer for keeping handy items close by. • No assembly Required–Pops out of the box ready to be placed on any bed. • Quality Steel Construction–Heavy duty steel with powder coat finish provides long lasting quality. • Reversible–Fits on either side of bed.